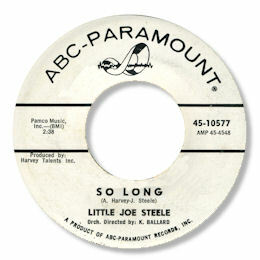 New York artist Little Joe Steele only made just the 2 45s but they are both fine efforts that deserve a much wider audience than they've so far gathered. 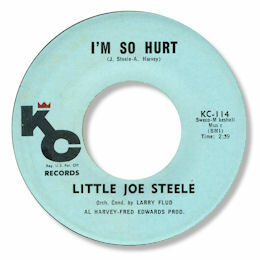 I'm So Hurt for Nathaniel "King" Cole's KC concern is an anguished blues ballad on which Steele sings powerfully and with considerable skill over a backing of cooing female chorus and a slightly latin tinged arrangement. I just love the way he hollers out the refrain. So Long is a cracking beat ballad powered by some tasty rhythm guitar, organ and powerful horns all very well put together by Kenny Ballard. Steele's voice rides over the top of this wonderfully well with some fine throaty passages towards the song's climax when the lovely chord changes kick in. I really like this one as well.